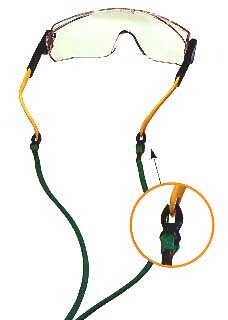 Chums, Ltd.se clips are standard on the Safety Chum eyewear retainers. The clips are designed to conform with the "catch and release" policy of various safety programs, and can work with the center punched ear piece found on a range of ear pieces. This product also features a perfed earpiece attachment and offers an adjustable fit.